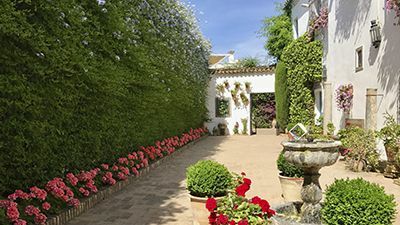 Are you an avid gardener and keen to visit some of the finest gardens and courtyards in Spain? You are in the best hands and the right country to live an unforgettable experience! Our gardens are very different from one region to another, as a result of its location, climate or history. In Catalonia, you can be delighted with the famous mosaics of ParcGuell in Barcelona, the subtropical gardens of the Costa Brava or the gardens of famous artists such as Gaudí, Silva, Rodríguez-Acosta and Bastida. In Madrid, you’ll find a very different offering with a more royal tone and some of the best green spaces in Spain such as the Retiro Park or the Botanical Gardens. 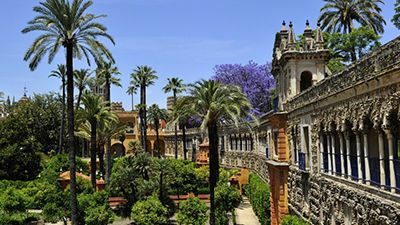 In Andalusia, you’ll find the Moorish influenced courtyards and gardens with in-built irrigation canals and water features, such as the exquisite gardens of the Generalife in the Alhambra Palace, the Alcazar in Sevilla or the charming patios and garden-orchards of Hispano-Muslim tradition in beautiful Córdoba. 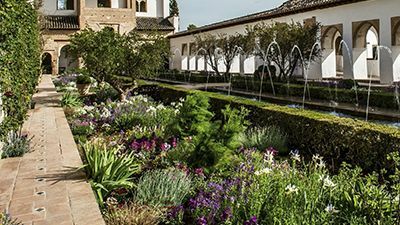 Spain’s garden style has its roots in the Islamic ‘paradise garden’ ‘of Moorish times. The Moors valued gardens, and created sophisticated and beautiful paradise gardens in the Persian style, predominantly private enclosed courtyards divided into quadrants, each with a water rill emptying into a central pool or basin. These were symbolic of the four rivers of paradise – water, milk, wine and honey – as described in the Qur’an. 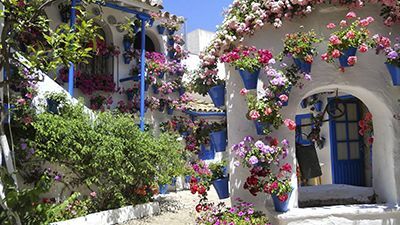 Gardens of wealthy Moors tended to be small and intimate, with decoration from painted tiles (azulejos), often in blue, green and white. Popular plants included myrtles, citrus, bay, cypress and palms. Although the Moors were finally defeated and driven out by the Catholic Monarchs Ferdinand and Isabella in the late 15th century, their garden style remained a strong influence for many years, gradually developing into a hybrid style called mudéjarused in larger estate gardens. Like the rest of Europe, the Italian Renaissance garden spread throughout Spain during the 16th century, with a notable example built by Charles V at Aranjuez in Madrid. From the late 17th century, French garden design exerted a stronger influence as the Bourbon kings, descended from France’s Louis XIV, took the throne. Grand allées of limes and hornbeams as well as parterres and elaborate formal water gardens appeared.By the late 18th century, the romantic English landscape park was all the rage, with temples, grottos, sculpture and staircases.The 20th century began a renewal of a distinctively modern Spanish style with the development of Parque Güell in Barcelona.